The eleventh card of the Major Arcana is Justice. Its prime message is that of accountability, of taking responsibility for your own actions. We make choices every day that help shape us into who we are. Justice encourages us to be honest with ourselves in all things. 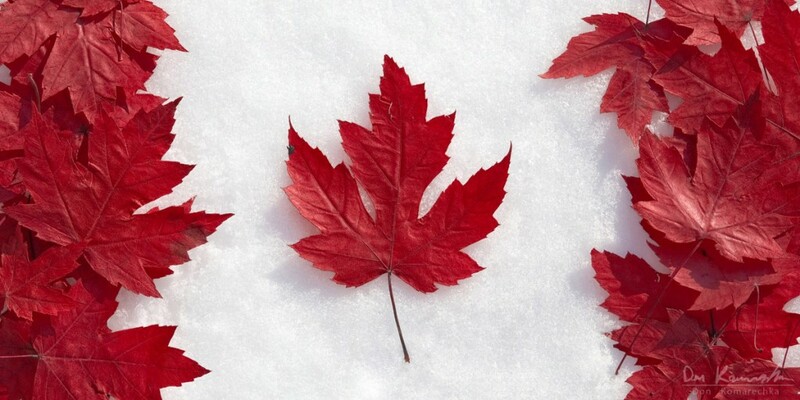 While it doesn't always represent legal issues, when it does it is a positive sign. Justice deals with the laws of cause and effect. That is not to say that everything you are dealing with is the result of your own actions. Sometimes you need to deal with things that result from the actions of someone close to you, which can be just as hard. This is not a card about good versus bad, right versus wrong, or punishment. It's more about adjustment, so that the scales end up equal. Early Justice cards appeared as number eight in the deck, taking the place of the Strength card to show that justice can be greater than power. It showed the familiar image of a woman holding a sword in one hand and a pair of scales in the other. The image was usually modelled after the Roman goddess Justitia or the Greek goddess Themis and wore a golden crown, while above her was a knight with a drawn sword who delivered justice to the world. Justice is often associated with Athena, goddess of wisdom , who not only provided the idea of justice, but provided a model as well. It is also associated with Maàt, the Egyptian goddess of justice, who also often appeared on this card. 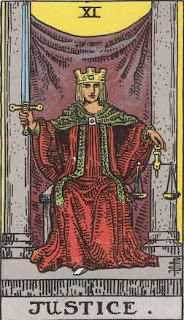 In the Tarot de Marseille, Justice is seated and grasps an upright sword in one hand, and a slightly out of balance set of scales in the other. The Rider-Waite deck shows her appearance as similar to that of the High Priestess. She is seated on a throne between two pillars with a hanging veil in the background. When the goddess Justisia is shown, she is usually blindfolded. But on the Tarot card Justice, she has no blindfold, showing that we must face our trials with our eyes wide open. Justice is wearing the red robes of a servant to the people, and sits on a plain stone seat. The crown she wears is a symbol of her authority and the small square on it represents her well-ordered thoughts. The square of the clasp on her cloak represents the law that protects the circle within it. In her right hand she holds a double-edged sword that cuts both ways, signifying impartiality. It is held point up, signifying victory, and can cut quickly to the heart of the matter. In her left hand she holds a set of scales to show that logic must be balanced by intuition. The scales themselves represent opposing arguments, the two sides to every story, and the balance between the present and the future. The purple cloth draped in the background is for compassion while the grey pillars show the constraints of the physical world. In its most basic form, the Justice card represents fairness, truth, and the law. As a final outcome to a spread it signifies that the fairest decision will be made. There will be a balanced judgement. This could refer to a legal matter you are a part of, and if so you can expect that justice will be served. You may be called to account for your actions and be judged accordingly. The scales of Justice are balanced, which means things will work out as they were meant to be. What happens will come from the decisions you have made and the actions you have taken in the past. Justice is a search for truth, not only within yourself but in others as well. This is a time to be objective when dealing with people and basing your judgement on facts, not rumours. You need to play fair and ignore those who are only trying to stir things up. When Justice appears reversed in a spread it generally means that you are avoiding taking responsibility for your actions and trying to blame others for your mistakes. You are where you are because of your past choices and have no one to blame but yourself. If you can look back and honestly say you couldn't have chosen a different path, then you might need to look deeper to find your way out of your present circumstances. Stopping judging yourself, and others. The world is not just black and white. You may need to bend the rules a little to get back on course, but do so in a way that is fair to everyone or the karma may come back on you. When Justice appears in your past, it's showing that the basis of a situation you find yourself in now can be traced back to a decision you made some time ago. This choice was the beginning of a turning point in your life. It's not a judgement as to whether this was a good or a bad choice, only you can decide that, it merely clarifies that this was the choice you made among all the others offered to you at the time. In the present position, Justice represents a decision you are facing now. It could be something personal, legal, or even something to do with a job or education. This decision is a crucial one, so weigh your options carefully. When this card appears in your future, it indicates that you may have a big decision to make soon. This may be a result of a many little decisions you've been making recently, and they will culminate in big changes. It's Monday again . . . already! How in heck did that happen? Well, the good news about last week is that I was getting to bed earlier (2 a.m. as opposed to 3:30 a.m.), which resulted in me getting up earlier. The bad news is, it didn't translate into getting anything extra done. Suffice it to say, I like this afghan so much that I'm going to make one for myself when I have the time, only mine is going to be rainbow coloured. I have to admit I kind of took it easy last week. We had a barbeque at the in-laws on Monday, and then Thursday I went shopping with a friend to Peterborough. I bought some mystery knitting patterns from a thrift store and was delighted when I got home that there were several sweater patterns I liked, and one book had a very simple Icelandic sweater pattern for the matching sweaters I want to knit that are also Christmas presents. 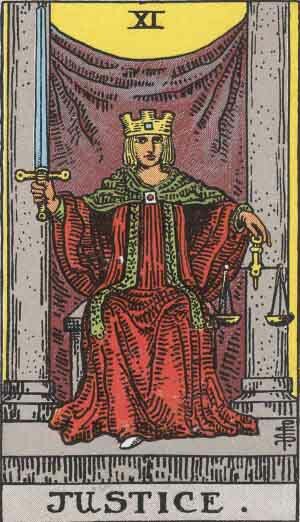 Tuesday: Part eleven in my series on the Major Arcana of the Tarot is Justice. Thursday: Chapter 76 of Water. Rest time is over for the group in the volcano. I wonder what's going to happen to them next? Friday: This week's Ramble is an offshoot of last week's. Talking about changing my hair got me curious as to why we do sometimes very weird things to our hair. So I'll be researching the history of hair styling. I actually did start using the TraxTime program last week to see where my time is going. I add new projects as I need them and if I don't want to have the computer going just to keep track of what I'm doing, I can just make a note of what time I start and finish something and then add it in later. And just so you know, non-fiction includes my blog posts and journaling, although I have them separated out by project; fiction includes the installments for Water as well as any other stories I may be working on; and editing is all editing, whether it's for myself or someone else. I'm actually surprised I didn't spend more time gaming, but the amount of time spent on crafting is no surprise at all. I started watching the first season of Vampire Diaries (that the daughter lent to me ages ago) and I was crocheting while watching. I also crochet when watching TV with the hubby at night. I guess it's pretty obvious which aspects need improvement, eh? Maybe next week I'll include the results of the previous week with the new week, just to see if I'm on the right track. I need to start with a little story. When I was a kid, the first sign of summer was my mother dragging me to the hair dresser where I would be given a pixie cut. This is like the girl's version of a brush cut. I loathed it. I suspect my mother did this because it was easier to brush a day's worth of childish wanderings out of short hair than long hair. After I graduated from grade six, I was allowed to make my own decisions about my hair and I chose to never get it cut again. Now, while of course I didn't keep that sweeping vow, I've only had my hair short a couple of times since then and both times were entirely by accident. Once was when I was about 16 and I tried to layer my own hair. It was a disaster and the only thing the hair dresser that my sister dragged me to could do for me was turn it into a short shag. Ironically, I've probably had more compliments on that cut than any other I've ever had, but I hated it with a passion. It was too short! The next time this happened it was to salvage what was left of my hair after a really bad perm. The pre-perm cut was not what it should have been and my hair came out a couple of shades lighter from the over processing. The texture was like straw. And granted I didn't get this perm from a high end salon that would have cost the same price as a small car, but it wasn't a discount salon either. I did, however, visit the high end salon to see if they could salvage my hair. Incidentally, this was the last time I ever got a perm. I've had bangs before, with my hair long and straight, and I became quite expert in trimming them myself. The problem is, I don't remember if I liked them or not. I do remember what a pain they are to grow out of. This involves letting them grow until they're driving me nuts by hanging in my eyes, at which point I start parting my hair on the side until my bangs are long enough to tuck behind my ears. Right now my hair is halfway down my back, which is about where it was last summer when I lopped a few inches to make it look neater, an act I almost immediately regretted. While it wasn't enough for most people to notice, I noticed. And it seemed to take forever to grow out again. One of the reasons I like my hair long is that I can do more with it. I can let it hang straight, I can braid it, I can pull it back with pretty barrettes, I can even put it up. And honestly, I find it less work than short hair. Short hair needs to be styled, and hair product applied to make it stay put. It needs to be buffed and polished before you can be seen in public. Don't get me wrong. I'm not trying to start some campaign to get people to grow out their hair. Some people prefer short hair and that's fine. I know a few people who look much better with short hair than long, more power to them. This is just my preference. I don't care what someone's hair looks like as long as it's clean. I once worked with a woman whose hair was in one big dread lock. We often speculated if she ever washed it, although no one was brave enough to ask her to her face. It was hideous - who knows what could have been lurking in that giant rat's nest. This was a professional woman who could easily have afforded the price of a visit to a hair salon, or at the very least a comb. One of our co-workers had training as a hair dresser and was going to offer her services to this woman, but unfortunately I left before I ever found out what happened. Number ten of the Major Arcana, The Wheel of Fortune, is one of the most auspicious cards in the deck. It generally means that unexpected good fortune is coming your way. But as with everything in life, sometimes this good fortune is a matter of perspective. You might need to take a close look at this unexpected event to see the good in it. The benefit might not seem obvious at first, but as the wheel turns the positive influences will be revealed. This is a card of luck and change. But it's also a reminder that for every action there is an equal reaction, so be careful of what you do and how it will affect those around you. By doing so you just might reap a greater reward for yourself. 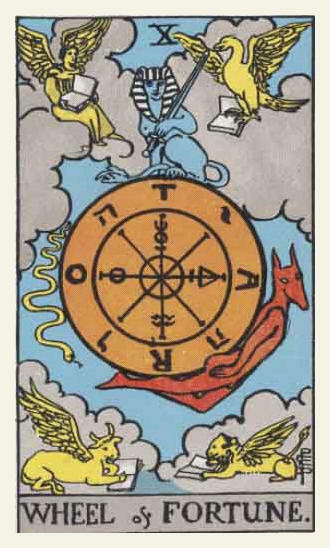 In the earliest known Tarot decks this card was known as La Rotta, the Wheel and has a figure at the centre of the wheel, surrounded by four figures. By the 15th century this figure was identified as the goddess Fortuna and the card is the Rota Fortunae. The card generally showed a human dressed in an Egyptian-style headdress and there were people sitting or riding on the wheel. The Visconti-Sforza deck has Fortuna, blindfolded and winged, turning the spokes of a large wheel clockwise. At the top is a monarch with donkey ears, symbolizing his foolishness. In the Rosenwald deck the wheel turns counter-clockwise and the figure shown is that of an animal, while in the Cary deck the wheel has a handle to control it. In the Tarot de Marseille there is no human figure, just animals dressed in skirts and capes crawling over the wheel. Most of the modern decks take the Rider-Waite deck as standard. The wheel itself is a symbol of the natural flow of energy. Because it spins, the wheel shows the changing cycles - good to bad, life to death, rags to riches. The blue background represents wisdom. The outer circle of the wheel represents the material world. The eight spokes represent not only universal energy, but the eight Sabbats of the year. The letters T-A-R-O, which can be interpreted as either Tarot (if you return to where you start) or Tora, alternate with the Hebrew letters of the unpronounceable name of God. You will also find the symbols for the four elements: earth, air, fire and water. Rising up the right side of the wheel, in what seems to be a counter-clockwise movement, is a red human-like figure with the head of a dog, a symbol of the ascending wisdom of our shadow side. The snake descending the left side represents the descent into the material world and is the Egyptian god Typhon, the god of evil who tempted Adam. The blue sphinx on the top of the disc holds a sword and represents life's riddles. There is a cloud in each of the four corners, which is symbolic of higher thought or energy. In the upper right is an eagle which represents both the zodiac symbol Scorpio and the apostle John. Below him is a winged lion, representing Leo and the apostle Mark. On the bottom left is a winged bull representing Taurus and the apostle Luke, while in the upper left is an angel who represents Aquarius and the apostle Matthew. The wings of these creatures symbolize stability in the midst of change while the books in their hands represent wisdom. The Wheel of Fortune is a card of destiny. It represents an unexpected change that can be so gradual as to go unnoticed. The change will be major, and will either be of great benefit or cause great problems for the person in question. The wheel means movement, rising and falling, as a person's fortunes can rise and fall. Though the changes brought about by this card are unexpected, they're usually changes for the better. In a Tarot spread, this card can indicate major breakthroughs . Things tend to go in cycles. Even if things seem bad right now the time is coming when this will change. Look for new opportunities or ideas. You need to accept the ups and downs of life; what comes around goes around. You need to take an active part to remain on the up side of the Wheel, so don't become discouraged when you're faced with misfortune. No matter which way the Wheel turns, it's impossible to try and change it - you need to go with the flow. When reversed, the Wheel of Fortune indicates things are out of sync. There could be conflicts of interest making this a good time to consider other options. Luck is not on your side at this time. There are negative forces in play that you have no control over. It can also indicate that you're resistant to change, particularly if the change is not of your choosing. In the past position, this card indicates big changes in your life that are the foundation for where you are now. In the present it's a card of good luck. Fate is smiling on you. In the future position this card is a reminder that all things change. Nothing lasts forever. As I mentioned in my last post, I've been sick. However, I managed to pull myself together in time for my poetry reading last week. I did not get my parody of The Raven finished in time, but it was a good reading anyway. I got to make a couple of new friends and the other poets were really great. I made it to the family reunion/picnic Saturday and had a good time. The weather was perfect. By Sunday I was back to feeling dodgy - too much activity when I was just getting over my bug, I think. But we went to the birthday dinner in Hamilton anyway, and again had a great time. Needless to say, I got no writing, editing, or pretty much anything else constructive done last week. I did manage to read a couple of books though. And I got the ripple afghan I'd started last year unravelled to repurpose the yarn for a different project. Tuesday: Part ten in my series on the Major Arcana of the Tarot is The Wheel of Fortune. Thursday: Chapter 75 of Water. Let's see how long it takes them to get out of the volcano. And I wonder what happened to Nereida's group? My social obligations are not over yet. My brother-in-law from out west is down for a week or two, so we're getting together with him for dinner tonight. He's the BIL that hooked me on General Hospital many years ago. When he was waiting to get his papers to go into the army he did a bunch of odd jobs around our house, but had to take a break every day at 3 to watch GH. When he went off to boot camp he asked me to watch it for him and tell him what was happening, so I'd write a daily synopsis and send them to him once a week. Oh, my. I have a crap load of stuff to catch up on this week. I don't even know where to start. First up, I think, I gotta make me a list and prioritize. A while back I downloaded a program called TraxTime. One of my employers used this to keep track of the hours we spent on specific projects (for billing purposes) and I thought it would be helpful with my own projects. Since I'm more or less starting with a clean slate (having no time for writing this weekend) I'm going to start keeping track of the amount of time I spend on various things during my day. This includes reading and craft work. And then starting next week I'm going to post the results - just to keep me honest. Apparently the dodginess I was feeling on Sunday wasn't just due to the heat. It seems like I've picked up some kind of bug. I spent most of yesterday napping and although I was feeling better towards bedtime, I felt better at bedtime on Sunday too, so there's no guarantee if I'm on the mend or not. So I've decided I'm taking a blogging break this week. I need to focus on getting well enough for my reading on Thursday. As long as I can stand for my 20 minutes of fame without falling over, I'll be good to go. So my apologies for anyone stopping by to read this week's Tarot post or the installment for Water. I promise I will be back next week. As I'm writing this, I'm surrounded by the dark. Okay, except for the candles on the TV set and the one on the little table beside my chair. Yes, that's right. Our power is out. We were sitting here, minding our own business whilst watching Continuum, and all of a sudden there was this big bang from the end of the driveway. We went outside and it appears that all the houses along our side of the street and down around the circle (ten houses all told) are without power because of a blown transformer. I have two and one half hours of battery life to go on my lap top before I'm reduced to reading books by candlelight. And don't think I won't! I've done it before. The ironic part, of course, is that except for a quick check of my email this morning I haven't been on the computer all day. Between the heat and a few health issues I was feeling dodgy today and decided since I got so much done yesterday I deserved a day of resting and reading. And wouldn't you know I was just starting to feel better when the lights went out. I just hope the power comes back on before the rising temperature makes me sick again. Did everyone watch Sharknado? Even funnier than the movie was the way it seemed to take over Twitter and Facebook Thursday night. It was on the Syfy channel in the U.S. on Thursday, but on the Space channel in Canada on Friday and Saturday nights. And for those who missed out, it's on Space channel on Tuesday night too. If you're a fan of the Mega Shark movies, you don't want to miss Sharknado! Busy busy week this week. I have my poetry reading on Thursday night, so I need to pick my poems and practice reading them. Will I get the Raven parody done in time? Probably not. But I'm going to give it a try anyway. Friday my daughter and I are headed up to my sister's cottage north of Kingston. The idea is to visit for the day and then bring my sister back here for a couple of days while the rest of her family drive back to New Brunswick. Sunday we're off to Hamilton for dinner with my aunt who's turning 85! And finally, if my poor brain and eyes get tire of all that reading and writing, I got a big ball of yarn on the weekend to start a Christmas present. All I have to do is decide on what kind of sweater I'm doing, and find a pattern. Update: It was almost four hours before our power was restored. Fortunately we have a swimming pool and this was not our first midnight swim. It was actually kind of nice out there - we have all kinds of solar powered lights in our back yard and the stars were really beautiful. As you know, my turn came up for the Absolute Write blog chain this week. The theme was "the dog days of summer." I've known about this month's theme since the last week of June and although I tell myself every month I should write my story right away, I never seem to get around to it. So Monday, the person ahead of me on the list was notified it was their turn and I figured I'd better get cracking on mine too. We get two days to get our stories up before we're bumped to the end of the list. Anyway . . . 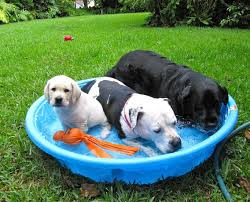 I thought and thought and couldn't come up with an idea so I resorted to doing a Google search on dog days of summer and I ended up looking at all these really cute images that came up in the search. 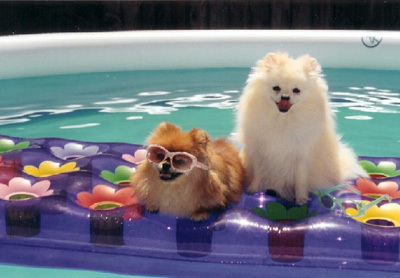 So THEN I started downloading the cutest ones, figuring I could pick one to illustrate my story. AND THEN I thought I'd just post the pictures for my turn. You know, a picture's worth a thousand words, right? But no, that would be cheating. So I ended up writing my story anyway (if you missed it you can find it HERE. Fast forward to yesterday, when I was trying to figure out what to ramble about. Whilst casting about for ideas, the folder I put the dog days pictures in caught my eye and I figured why not? 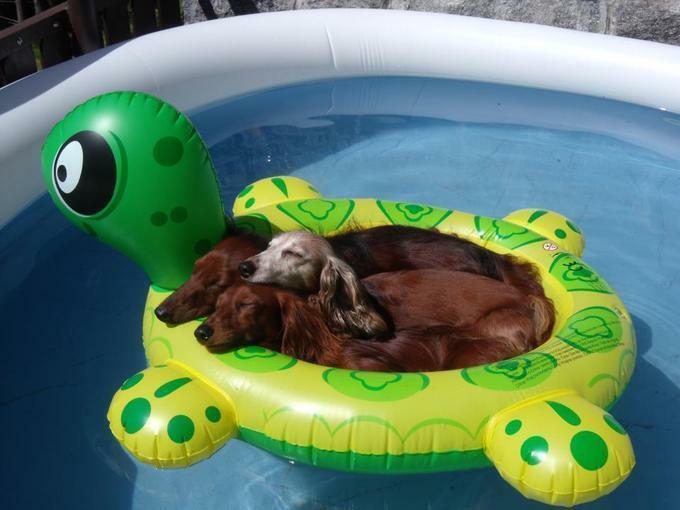 So here you go, ten cute pictures of dogs cooling off in the summer heat. Once again it's time for the Absolute Write blog chain! Today started pretty much the same way as all my days start. The alarm was set for 7 a.m. so I made sure I was up and ready to go by 6:30. And I am not quiet about it. I take bets with myself as to which member of my family will complain the most. It's a little thing, but it makes me happy. While waiting for the rest of the family to stir themselves, I check out the back yard to make sure nothing untoward happened during the night. I do a circuit of the yard, check out the gardens, and even check under the row of big pine trees to make sure no little woodland creatures are lurking there. Hearing the call for breakfast, I join the family in the kitchen and we have the usual race to see who finishes first. I win, of course. The kids are off school for the summer but that doesn't change much around here. One of them is barricaded in his room with his music turned up way too loud, another is glued to a game console. They were so cute when they were little. I can't help but wonder what happened to them. The girls decide to spend the day at the mall and promise to bring me back something special. That's sweet of them, but they really don't need to. It's not that I don't appreciate their gifts, it's just some times their choice of what's appropriate can be a little . . . off. There's really not much to do until lunch time and I try to coax one of the boys into going for a walk with me. Exercise is important you know. However, I'm overruled with a chorus of "It's too hot out." I head out the back door by myself and I have to agree. 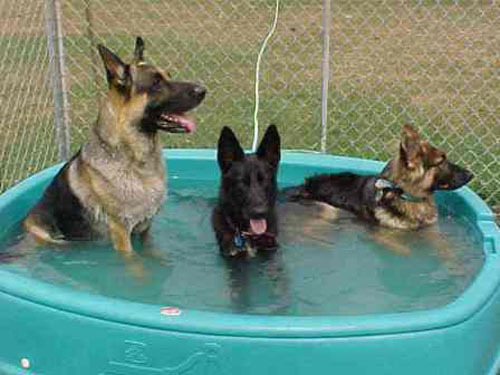 It is hot out. The dog days of summer are upon us. 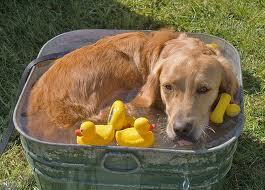 I don't know why they call them dog days, dogs don't like the heat any more than people do. I haven't been outside long when I spot the cat from across the street skulking through the tiger lilies. I'm not a big fan of cats in general - except for Tigger, who lived with us a few years ago - and I absolutely loathe that grey and white menace from across the street. I think he knows it too. 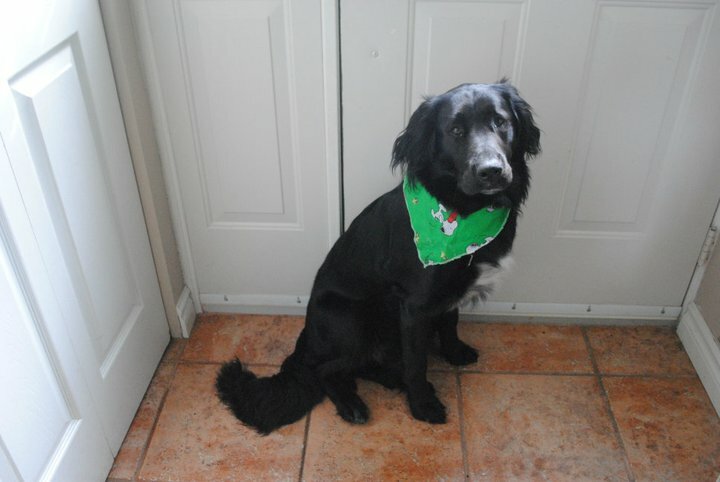 He sneaks into our yard and pees on the screens at the back of the house and leaves dead birds on the sidewalk. Naturally I chase the little bugger out of our yard. Unfortunately our path takes us through the garden, which I'm sure I'll catch hell for later. But whatever it takes to get the job done, right? Anyway, I'm so intent on catching that damned cat that I don't see where we're headed until I slam into the wooden fence. Damn, that hurt! And I almost had the little bugger too. I stay where I am, catching my breath for a minute, glad the rest of the family wasn't around to see it. 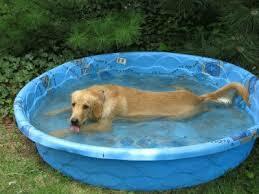 Chasing that cat is downright exhausting, so I decide to take a quick dip in the pool to cool off. Heaven. Absolute heaven. I'm not really supposed to be in the pool by myself, ever since the "incident" last year, so I only stay in long enough to lower my body temperature by a degree or two and then decide to have a nap up on the deck. I must have been more tired than I realized because the next thing I know I can hear the van pulling into the driveway and then its doors slam. The girls are home. I've been sleeping long enough that I'm dry again and I go back into the house to see when supper's going to be ready. "Hey Max, where are you? I got something special for you." It's the tone of voice that gets to me. All that unbridled enthusiasm. I really should know better, but I fall for it every time. I jump to my feet and follow the sound, only to stop dead in my tracks when I see the scarf being held out. "Isn't this the cutest thing ever? It's to celebrate summer. You'll look so adorable in it!" I look at the scarf with the cartoon beagles on it and heave a sigh. They say every dog has his day - today was not mine. Number nine of the Major Arcana is The Hermit. The loner card of the Tarot, The Hermit is the archetype of the wise old sage, the father figure or mentor, who gained his wisdom through experience and learning. He shines his light on confusing or mysterious things to make them understood. He needs to go his own way, do his own thing, and follow unexpected opportunities. The Hermit indicates a feeling of impatience when it comes to dealing with other people. He can be sensitive to having his peace disturbed and is likely to be somewhat anti-social. This is a card of spirituality, even if you are an atheist. It represents whatever the term "spirit" means to you. It's also a card of introspection and analysis. It indicates a desire for peace and solitude to think and take stock. But this quiet time allows for a new understanding of the world, and bestows the ability to see things that weren't perceptible before. In the earliest Tarot decks, the ninth card was not The Hermit, but "El Gobbo," which meant The Hunchback. In the 15th century Minchiate depicted this card as both a hunchback and a beggar, while Visconti-Sforza showed the man on the card as Time, and had him carrying an hourglass rather than a lantern. Another image, found in the Musee de Beaux Arts in France, shows a beggar on crutches with angel wings and a similar image is dated almost a century later. In the 16th century, Geoffrey Catelin depicted the Hermit carrying a lamp, signifying wisdom. This image continued with very little variation to the Rider-Waite deck. In the Vikings Tarot this card is Heimdall, who lives at the edge of Asgard waiting for signs of the coming of Ragnarok. In the Mythic Tarot deck the Hermit is depicted by Cronus, while in the Sacred Circle Tarot he is the Shaman. The Hermit is a solitary figure standing on a mountaintop. His white beard is a sign of age and wisdom, a benevolent mentor looking down on his disciples. The grey cloak conceals him, indicating that to learn his secrets you must be willing to seek him out. In one hand he carries a lantern holding a six-pointed star. This light illuminates the light of the mind and is a symbol of wisdom. In his left hand, the hand of the subconscious mind, he holds a staff symbolizing his power and authority. The mountain he stands on symbolizes growth and accomplishment, while the snow under his feet represent the height of spiritual attainment. In general this card indicates there is a need for time alone to do some soul searching or serious thinking. There are questions that need to be answered but these answers must come from within you. There's a need for a period of reflection where distractions are limited. 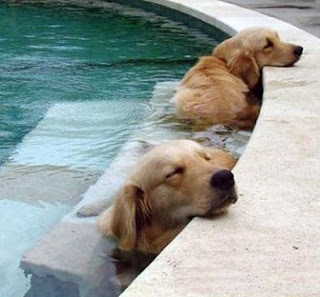 Don't be afraid to take some time for yourself. Reversed, the Hermit can indicate you're either not taking enough time for personal reflection, or you're taking too much. If you've been struggling to connect with your spiritual self, you need to try harder and listen to your inner voice. But if you've already been spending a lot of time in reflection, perhaps you're becoming too isolated and you need to rejoin the rest of the world again. If the Hermit appears in your past, it shows that whatever you have accomplished you've done it on your own. If you've accomplished very little, then perhaps you were associating with the wrong people who were keeping you from your destiny. In the present it can mean that you are alone or in an unhealthy relationship. It could also mean there is an abandoned person looking for you. In the future position, the Hermit indicates that you need to spend some time alone, even if it's only in reflection. Daphne and Donald have still not given up entirely on the pool. In fact, I was awakened yesterday morning by loud quacking outside. Daphne was perched on the edge of the pool cheering on Donald as he was trying to drive away the interloper duck (they were on the grass). 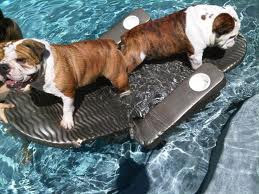 After he succeeded, he joined Daphne on the edge, at which point she jumped in the pool for her bath. 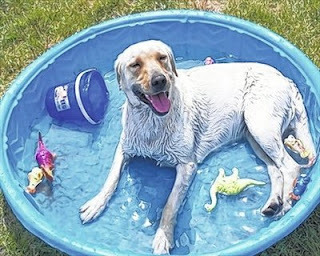 She splashed water vigorously over herself, went back up onto the edge to dry off, then back in the pool for round two. After she was nice and clean they both relocated to the pond garden where they hunkered down in my flowers for a nap. I have to tell you about a really cool thing that happened Saturday night. Around 2 a.m. we had a mysterious visitor. The hubby spotted a tall, thin silhouette on the edge of the pool, but it was so dark we really couldn't make out what it was. Before I could take a picture, it flew off into the yard, and then we could see it silhouetted in the light on the pond. We're pretty sure it was a great blue heron - probably checking the pond for frogs. Did not get my genre stories done for my writing group this week, nor did I work on my parody of The Raven. And I almost forgot that I promised a special hunk for my U.S. friends, so it got posted at midnight on the 4th instead of earlier in the day. Tuesday: Part nine in my series on the Major Arcana of the Tarot is The Hermit. Thursday: Chapter 74 of Water. What could be worse than a volcano erupting around you? You'll have to check out this week's episode to find out. Friday: Another mystery Ramble. In other words, once again I have no clue what I'm going to talk about. Once again I signed up for the Absolute Write Blog Chain and my turn will be coming up this week. Probably Wednesday, so don't be surprised if the hunk is delayed until later in the day. 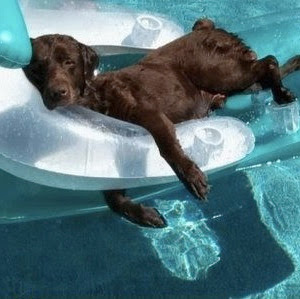 The theme for the month is the Dog Days of Summer and I have no clue what my story will be, but it's moving to the top of my priority list. I'd like to get a least one of my two genre stories done for my writers group meeting on Wednesday. As you may recall, this whole thing was my idea to begin with and I'm the only one who hasn't been getting her stories done. Next on the list will be working on the Raven parody, 'cause I'd really like to have it done for my reading next week. So . . . as I type this, it's 2:30 a.m. and I've been wracking my brains for the last couple of days trying to come up with an idea for my Ramble for this post. I've pretty much used up my quota of material on visiting critters - unless you'd like to know that the ducks have pretty much given up on the pool finally. Well, except for one of the drakes. He's pretty persistent although he doesn't swim in the pool, just roosts on the edge. He was there the entire day yesterday, just huddled on the rail. And the blue jays and squirrel still visit if I leave peanuts out for them. Actually, one of the jays perched on the back of the chair right next to me a couple of days ago. And the squirrel comes right to the back door to see if I'm around - although he might just be there to tease the cats who are on the other side of the door. And I think we're pretty much done with the garden stuff - unless you're interested in the fact that the pineapple mint is dying off in my mint garden, and so is the spearmint, but I have no idea why. And although the dill sprouted, the other seeds I planted did not. While outside the garden around the fountain looks beautiful - the pansies are blooming, as are the porculaca, and the snapdragons made a comeback. As for my terrarium . . . it's turning into a jungle. The really sad part about not being able to come up with a decent idea for this post is that I've had a lot of story ideas lately. Now you may think that this shouldn't be a problem for a writer, but you'd be wrong thinking that. These ideas come out of no where, usually when I'm trying to write something else. And they won't leave me alone. Like when I was trying to get some editing done on Magical Misfire. I suddenly got an idea for a sequel to a trilogy that I only have one book written in. The main character just popped into my head and wouldn't go away. I finally broke down and wrote out the bare bones of the idea, but then he was back again when I was trying to write this week's installment for Water, trying to entice me away by describing whole scenes and conversations. AND to make matters worse, when I do get the opportunity to write some of these scenes down, there's some kind of blockage between my head and my hands. Usually this means the idea isn't ready yet, but meantime there's another story idea tickling at the back of my mind. Enough with the new ideas! Give me some space to finish some of the gazillion ideas I'm working on already! And no, I don't think I'm tempting fate by saying that. Because I have enough ideas already in the works that I probably won't finish them all before I die of old age! I think I need to start typing faster. The common courtesy portion of this ramble is courtesy of my husband. He asked me earlier if I was working on my ramble and I confessed that I didn't know what to ramble about and he said: "Rant about people who go down to the beach ten minutes before the fireworks start and set up their chairs right in front of people who've been sitting there for over an hour and a half." Or something like that. I can't remember his exact words. But that's exactly what happened. We walked down to the beach and got there about an hour and a half before the fireworks were supposed to start, and set our chairs up in a likely spot and sat down to wait. Then about ten minutes before the show started, this family of like 6 adults and a couple of kids, waltzed onto the sand in front of us and proceeded to set up their chairs. It wasn't so dark that they couldn't see us sitting there, and even if they were blind they would have heard us because we were not quiet when mentioned the rudeness of certain people, but they acted like they were the only ones on the beach. Yeah, I know it was fireworks and in the grand scheme of things it didn't matter where anyone was sitting 'cause the show was up in the sky, but the point is, these people were totally rude. And it wasn't like the beach was so crowded there was no place else to sit. The weather was windy and overcast so there was only about half the crowd there usually is, which meant there was plenty of space on the beach. And to top it off - it started to rain as soon as the show was over, so we were drenched by the time we got home. Although Strength was numbered XI in the Tarot in the early days (Justice being number VIII instead), it became number VIII in the Rider-Waite deck to fit better with the astrological sign of Leo associated with it, and most modern decks use this numbering. Either number is considered acceptable. This is the card of interaction between physical and emotional forces. It concerns inner strength, self-awareness, and self-control. Strength was originally called Fortitude and indicated restraint in attitudes toward pain and danger. Neither pain nor danger was wanted, but neither could be avoided. There were two very different images for Fortitude: one was a woman with a stone pillar which she is either holding or breaking, and the other had and indistinct figure subduing a lion. 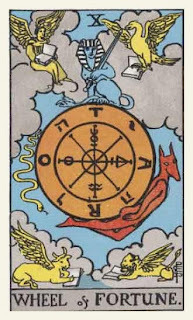 Crowley called this card Lust, and focused on the sun sign of Leo, which indicated sexuality, creativity and intuition. The Vikings Tarot depicted Thor trying to lift the Midgard Serpent while the Mythic Tarot used Hercules to represent Strength. The Rider-Waite deck merged the original two images to illustrate this card. In most decks you will find Strength depicted by a woman in a white robe holding or stroking the head of a lion who stands beside her. The white of her robes indicate her purity and innocence, as does her floral crown. Over her head floats the infinity symbol, almost like a halo. It's the symbol of energy and thought, as well as possibility and self-mastery. The belt of red roses she wears wraps around the lion's neck as well. She has overcome the lion with inner strength, rather than physical strength. Her left arm, which rests on the lion's head, represents intellectual effort while the right, which holds the lion's head in place, represents physical effort. 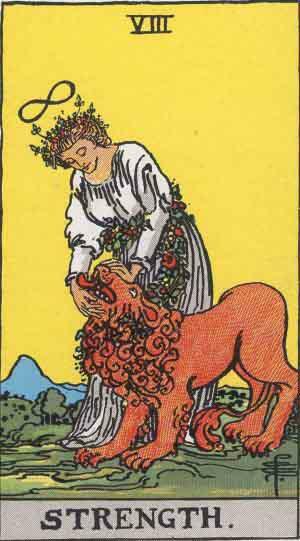 The lion is traditionally a sun symbol of our animal passions and desires. This lion is gazing up at her adoringly, tail between his legs, and is licking her hand. He has been successfully subdued, indicating mastery of these baser instincts. The use of a woman to illustrate this card is an indication that we're not just talking about physical strength here. The woman gazes down at him with a peaceful look on her face, in total control of her emotions. In general, Strength tells us we are in full control of our animal nature, and that patience and gentleness with gain us more than brute strength. It represents determination and the inner strength to overcome any difficulty. Gentle persuasion and acceptance will win others over to your way of thinking. The qualities represented by this card are already in you, you just have to conquer your fears and let them out. You need to find the confidence within yourself to do this. Results may be slow, but if you hold your own you will get a great deal accomplished. However, when Strength is reversed it represents weakness. Perhaps you've recently experienced a setback or you've begun to doubt yourself. Your inner strength and courage are lacking. You've been giving in to your impulses and baser instincts and shown a lack of self-control. Bullying won't solve your problems. There's a lack of self-confidence indicated and a need to face reality. You need to reconnect with your self-confidence and give your self-esteem a boost. When Strength appears in a spread, it can indicate that you're facing a challenge that requires an intellectual response rather than brute force. When it appears in the past, it shows the basis of the situation you find yourself in currently. You're reaping the benefits of your patience and expertise. In the present position, it shows you are in control of your own place in the world. This is not a domineering control, but rather one wielded with understanding and cooperation. Although you are most definitely in charge, others do your bidding because you've created a pleasing work environment and made it worth their while. Strength in the future indicates that whatever is bothering you in life will not do so for long. You will soon bring it under control. Use your inner peace and self-confidence and you can master any challenge. Most of my weekend has been pretty quiet, although we'll be going down to the beach tonight to watch the fireworks, along with pretty much everyone else in our town. We live about a twenty minute walk away from the beach (if you take the shortcut behind the high school and cut through another park) so we just need to take some chairs with us. Because of our great location, we usually get friends and/or family parking here rather than taking the chance of finding a spot closer. Picture thousands of cars and only hundreds of parking spaces. And then after the fireworks you have all those cars trying to leave at the same time. It's like a town-wide traffic jam. We've had enough rain so far that we've only had to water the gardens a couple of times, but they're doing really well. Not as well as the plants in my terrarium though. They've grown twice as much in one week as the same plants in my pond garden have in three weeks. Seriously! And one of the ones in the back has a really pretty, pale mauve flower on it. Tuesday: Part eight in my series on the Major Arcana of the Tarot will be Strength. Thursday: Chapter 73 of Water. I think Ravi and Taja are going to have their hands full this week. No meetings, but now I've got two genre stories to finish for my writers group. A horror story written to a picture of a woman in a pond or lake, and a romance involving a carousel. I've got a good start to the horror story, and I really need to push myself to get it done. The poemwork for last week's poetry meeting was to write a poem from the point of view of an inanimate object. At first I was going to just blow it off, but then an hour before the meeting I had a sudden inspiration and dashed off a poem. This has inspired me to want to finish the parody of The Raven I started earlier in the year so I'm adding it to this week's project list. Edits, edits, and more edits to Magical Misfire. While I got some done on the weekend I didn't get as much done as I'd have liked, it being a holiday weekend and all. But because it's still a holiday today there's no reason I can't spend my time however I like - which will be in my office, hard at work.